Sam Patterson from Sam Patterson and Son’s Paving. As the owner of Sam Patterson and Sons Paving, Sam is the face of his company. He has to look his best when dealing with customers. Sam worried about the impression his smile made on current and potential clientele. He scheduled a cosmetic dentistry consultation to discuss his concerns with Dr. Norman Medina at Seasons of Smiles. Fractures, spacing, and other dental issues made Sam’s smile appear a bit uneven. In addition to compromising dental function, these problems also had a negative impact on the appearance of Sam’s smile, which directly impacted his self-confidence. At Seasons of Smiles, we call cosmetic dentistry “emotion” dentistry, because how we look is closely tied to how we feel about ourselves, and how others view us. 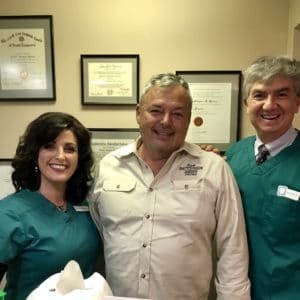 After the consultation, Dr. Medina explained how modern dental procedures could address both the function and appearance of Sam’s smile, to give him a professional appearance and improved self-image. Sometimes showing is better than telling, especially when it comes to cosmetic dental procedures. Because of the smile preview software Dr. Medina uses in our office, Sam literally saw what his smile would look like before making treatment decisions. After exploring his options, Sam agreed with the proposed treatment plan, and was soon on his way to a sensational smile! Sam was a wonderful patient, fully committed to realizing his new smile. He showed up for every appointment, asked great questions, and worked with our team to achieve the desired outcome. The result was a smile that Sam absolutely loves. Now, when you see Sam out on the job, he’s all smiles. Sam is confident about his new smile and truly believes he has garnered new business from it. We want to say Thank You, Sam for telling everyone about Dr. Medina and his staff at Seasons of Smiles. Do you have cosmetic or restorative dental concerns and would love to see how your smile could be transformed? Contact Seasons of Smiles today online, or by dialing (207) 236-4740. We look forward to helping you put your best foot forward too!